Throughout product descriptions, articles and discussions we find ourselves talking about again and again about the so-called amplifier classes which are in place to demarcate the operation of the respective circuit. But how can we really classify them? How does the ordering really work? Why are there different different classes at all? And what are the advantages and disadvantages does each bring with them? We’ve taken the best known of examokes from across the board – Classes A, B, AB and D – viewing them in more detail so that we can take this question head on. Before we jump to the amplifier classes in detail, we first need some knowledge of the electronic component that is responsible for signal amplification. In general, today these are transistors and for the purposes of this article, we’re going to focus on the same contemplation, whilst tubes too are installed for this purpose. A transistor is basically an electronic operating switch, the switching function being based on semiconductor technology. The mechanical component, typically a switch, is replaced by a transistor in the semiconductor material whose conductivity is controlled by a signal, which can can be affected, for example, if a voltage applied. The transition between the two switching states “non-electrically conductive” (stop band) or “completely electrically conductive” (saturation region) is carried out continuously, so that the semiconductor material can take any intermediate states of partial conductivity depends on the strength of the control signal (amplifier section). In this way, a current can now be flowing through the transistor output current control. In the amplification of the music, there is the audio signal, which is applied as a control voltage at the base of the transistor and affects the flow of the treated stream outlet. 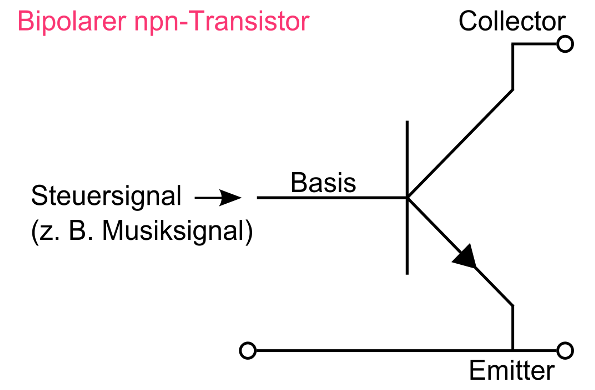 The above shown npn transistor is fine however without further action for two reasons only partially for the amplification of an audio signal. On the one hand, the conductivity of the semiconductor material only sets if a positive control voltage is applied. However, since the audio signal based on AC, it would only partially amplified in the consequence and would have the undesirable distortions. On the other hand, each semiconductor material has a physically determined threshold value, must exceed the control signal before the transistor is effectively transferred from the lock area to the amplifier region. Additional error in the gain would be the consequence and the ultimate goal – a low-distortion possible translation of the music signal – would be impossible. To solve these problems, there is now a number of different approaches that can be distinguished on the basis of amplifier classes. A crucial role is played by the so-called operating point of the transistor in Class A operation. This describes the quasi-neutral state of the component that exists whenever just not have audio signal at the base. Normally, the operating point is therefore in the locking region of the transistor. If you put though a rigidly adjusted direct current (quiescent) on the basis of, can the operating point depending on the strength of this direct current theoretical “move” at any point over the entire operating range of the transistor. Thus, it is held permanently conductive during operation to some degree. In Class A operation, the operating point about midway between blocking and saturation region of the transistor. In this way, not only is the threshold exceeded at the outset, what is already in itself has a positive impact on the quality of the amplified signal and there’s also the possibility to use only one active component (single-ended circuit) for the amplification , Total Class A amplifier apply – whether single-ended run or not – as particularly low distortion. The major disadvantage of this variant is the low efficiency. From the constant conductivity of the transistor natural result an uninterrupted flow of power flow and, consequently, a high heat. This mode of operation differs from Class A, in that no manipulation of the operating point occurs, and thus this is in the blocking region of the transistor. Nevertheless, in order to ensure the amplification of the full signal, it requires the Class B push-pull operation necessarily a so-called or push-pull circuit. 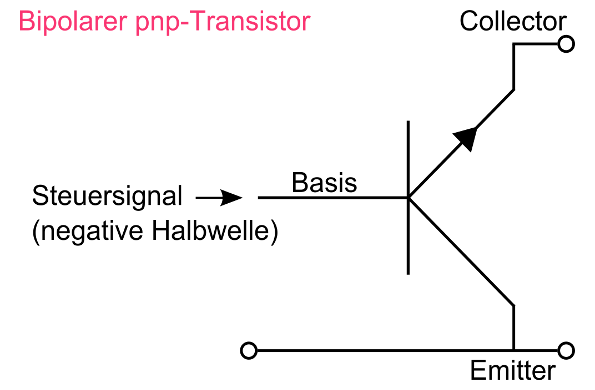 Here, the NPN bipolar transistor is completed by a further semiconductor reverse polarity (pnp) and split the audio signal prior to amplification in the positive and negative half-wave. Following the amplified signal components are reunited. This variant has of course advantages and disadvantages. First, the undissolved threshold problem results in the amplification of the respective half-wave of undesired distortions. In addition, signal splitting and the two never exactly identical transistors operating make the circuit as a whole more complex and less straightforward than, say, a single-ended solution. On the other hand, the efficiency is considerably higher and the heat accordingly lower. Overall it can be said that the combination of operating and push-pull circuit in hi-fi did not gain from Class B. It should not be considered insignificant that the Class AB amplifier to unite the elements of the already known Classes A and B and combine the push-pull circuit with a shift of the operating point. So in this case are at the bases of the transistors at low quiescent currents, which are just large enough to bias due to the threshold problem for the individually amplified half-wave (see Class B) to decrease. As a result, the Class AB operation provides a good compromise between low distortion and ensures efficient amplification. Also widespread now are the Class D amplifiers, which are also called switching or digital amplifier. 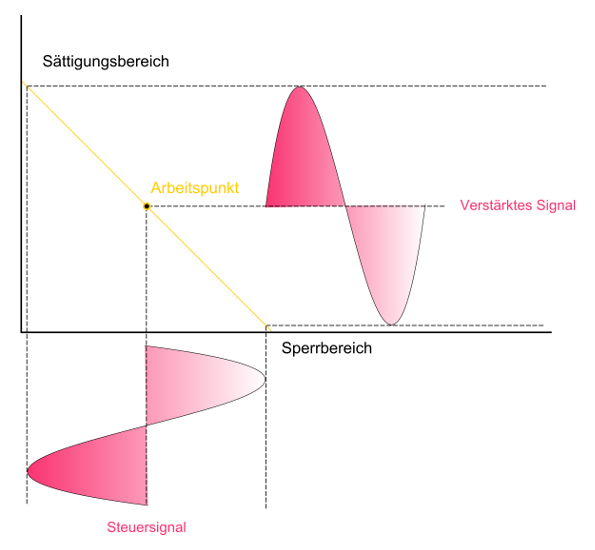 The latter term is somewhat understandable since the operation of such switching amplifier principle allows reminiscent of the digital processing an audio signal; and the shift is in some devices even controlled digitally, but of course also drives the Class D operation ultimately an analog signal to the speaker. Plays a central role in the Class D amplification of the so-called comparator that compares the voltage of the audio signal with a triangular signal generated in a uniformly high clock. The clock rate can vary from several hundred kilohertz and a few megahertz. A switching operation of the transistor is always triggered at such a clock step in which the voltage of a signal exceeds the voltage of the respective other signal, or falls below. Here, the transistor switches only between the two extreme states: stop band and the saturation region, so that what was so important in previous classes amplifier region plays virtually no role here. 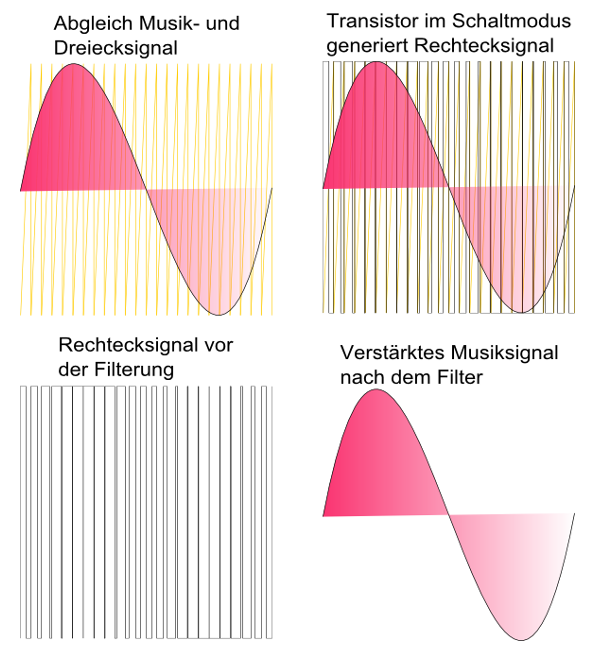 Following the switching amplifier is now first of all a pulse width modulated square wave signal, the final means of a filter in which: – is transformed audio signal – is now increased. Class D amplifiers are characterized by their high efficiency of enormous, can therefore be made very small and compact and come in all kinds of devices from mobile phones to the hi-fi system used. Decisive for the quality is a good circuit and filter design, so that distortion and interference are minimized, which can arise due to the high frequency switching. We have reached the end of our little survey. Anyone who is on the quest to learn the rank the relevance of audio and hi-fi against a number of other amplifiers needn’t continue. As illustrated above the Accuphase E-600 is the way to a Class A amplifier, the power consumption is estimated at idle with at least 160 watts. In theory is any transistor possible to be biased as class A, AB, B etc? for audio amplification purposes. Thank you!